For each year of this series I spent quite a bit of time deciding which film was the most influential on my life. I read lists of all films released, as it’s certainly possible a low-grossing cult hit could have impacted me more than any blockbuster or award-winner. I spent at least 30 minutes researching every year before making my decision. Well, every year except 1977. 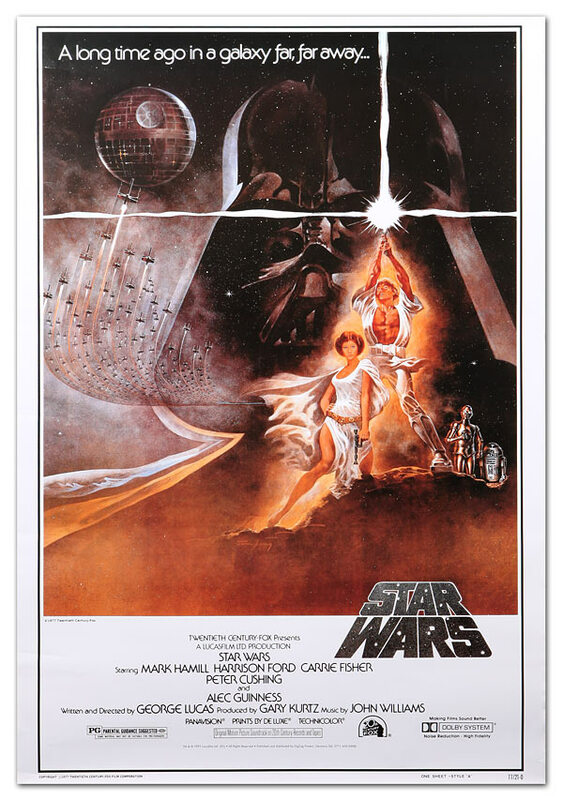 I only half-jokingly ask: Were any movies released in 1977 other than Star Wars? More accurately, do any other films matter when stacked up against Star Wars? Looking at the year’s biggest films, there was Close Encounters of the Third Kind, which furthered Stephen Spielberg’s career and has legions of fans (I’m not one of them). The Woody Allen crowd will point to Oscar-winner Annie Hall. It’s an okay film but, to me, forgettable. Smokey and the Bandit and Oh, God! were products of their time, and neither aged well. Even that year’s James Bond release — The Spy who Loved Me — is a letdown. But then there is Star Wars (and note, I refuse to call it A New Hope; when it came out in 1977 it was simply Star Wars). The film is more than a cultural phenomenon, it is a global icon. Star Wars transcends nationality, race, gender, and age. Everywhere I go, from Illinois to California to Germany to Spain to Mexico, I find Star Wars fans and collectibles. It is not hyperbole to say Star Wars forever changed cinema. 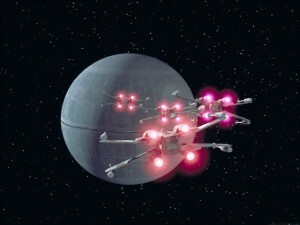 On a meager budget George Lucas’ team developed entirely new ways to film special effects. John Dykstra’s computer-controlled Dykstraflex camera allowed for dynamic, active shots of ships in space without use of visible fishing lines. The rapid-fire, Academy Award-winning editing — courtesy of Paul Hirsch, Richard Chew, and (George’s ex-wife) Marcia Lucas — created an excit ing feel while trusting audiences to keep up with a story that starts in the middle of the action. Not only did Star Wars raise the bar for science-fiction and action spectacles, it quite literally and fundamentally changed the way movies were made. I have heard and read the complaints that Star Wars forever ruined movies by relying on hackneyed character tropes, choosing action over acting, and making audiences care more about the spectacle than the story. I dismiss those comments as rhetoric. People love to lay blame, and there’s a hipster-coolness to attacking any cultural touchstone. Yes, there are numerous Star Wars imitators that have taken these impulses to mind-numbing extremes, but that is the fault of each film’s creator. Star Wars simply showed moviegoers and movie-makers alike what could be done. Personally, Star Wars was a film that would shape the way I view movies. As a child it made me believe in magic. In my late teens it introduced me to Campbellian mythological structure and archetypes. Honestly, it has — directly or indirectly — influenced every major decision of my life. 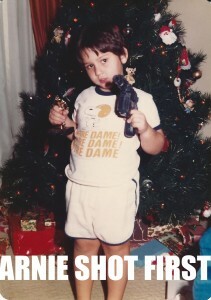 I’m told my parents took me to see Star Wars in 1977. I would have been 3, maybe 4 years old, and I have no memory of seeing it on the big screen. I do remember the toys. When I was still too young to read I saw a little green alien action figure (Greedo) in the toy aisle of our Kroger grocery store and I wanted him. My parents read this as me loving the film and started to buy me more figures in the toy line — which confused me at first. But over time I grew to understand not just the figures, but the movie which I watched in an endless loop for many years. Then I expanded to the video games (on the Atari 2600), Star Wars novels, role-playing games, and more. As the Star Wars sequels were released I became even more enthralled with the universe, and it is a love that never waned. In the late 80s, when Star Wars was in a lull, I still watched the movies and reread the books. In 1993 my college dorm held Star Wars Sundays. HBO seemed to play the trilogy every week, and I formed a bond with my fellow students through this shared childhood love. It was Star Wars that led me to online forums. It was Star Wars that motivated me in 1996 to build my first personal website about the Star Wars toys I collected and the role-playing game I was running. In 2005, it was Star Wars that motivated me to look up the definition of a podcast, and then to dig an old microphone out of the closet and start my first show, Star Wars Action News. Throughout the past nine years I have traveled across this country — and to Germany — taking part and speaking at several conventions. I have hosted sold-out Star Wars fan events and even presented on the Kotobukiya stage at San Diego Comic-Con. I was honored to have StarWars.com claim my Star Wars collection was one of the largest in the world. I have had the honor of touring Lucasfilm, and even briefly met George Lucas himself. Since starting Star Wars Action News I’ve gone to new places, had new experiences, interviewed actors, producers and writers, and made dozens of new friends. All of that goes back to this one film from 1977. The truth is, without Star Wars you would not be reading this article. My love of Star Wars grew into a love of film, and my Star Wars podcasting grew into a network of podcasts that includes the movie review show Now Playing Podcast, which has become our most-downloaded show and a staple in the iTunes top TV & Film audio podcasts category. As a film critic, Star Wars is the film by which I measure all other blockbusters. Transformers may have modern effects and louder explosions, but does it create the same sense of wonder in its audience? Is Sam Witwicky a suitable audience avatar — a hero in the vein of Luke Skywalker? Now, I do realize every Star Wars film has its flaws, from wooden acting to redundant plot points to convenient character revelations. But I don’t care. I may be turning 40, but when I watch Star Wars I’m 6 years old again, and I love it. Star Wars has shaped my life, and there is no other film from 1977 that can compete. What an amaZing tribute to fandom! I’m glad that Star Wars out you on a path to create everything you have. My love of Nightmare on elm street led me to your podcast. Now I listen and read all of it thanks to Star Wars. I like that the reviews are more how the movie shaped you, and not just a straight review of the movie. Interesting spin. Which begs the question why has there never been a Star Wars retrospective? Holding out for a donation drive? That would bring the cash in hand over fist! Arnie – these are really well done. I don’t watch many movies but am enjoying your “top 40”.